Elaine Chao, the U.S. Secretary of Transportation, used my conference room today while waiting for a meeting to start down the hall. 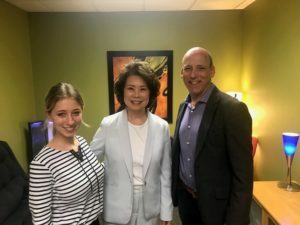 She was in town to discuss transportation issues with Congressman Chabot and representatives from Uber, Red Bike, and the Chamber of Commerce among others. She and her staff were incredibly gracious.